CEO Of U.S. Gun-Maker Faces Jail In Germany A decade after Sig Sauer inked a deal to sell up to $306 million worth of pistols to Colombia's National Police, company CEO Ron Cohen is facing jail time in Germany for making the sale. 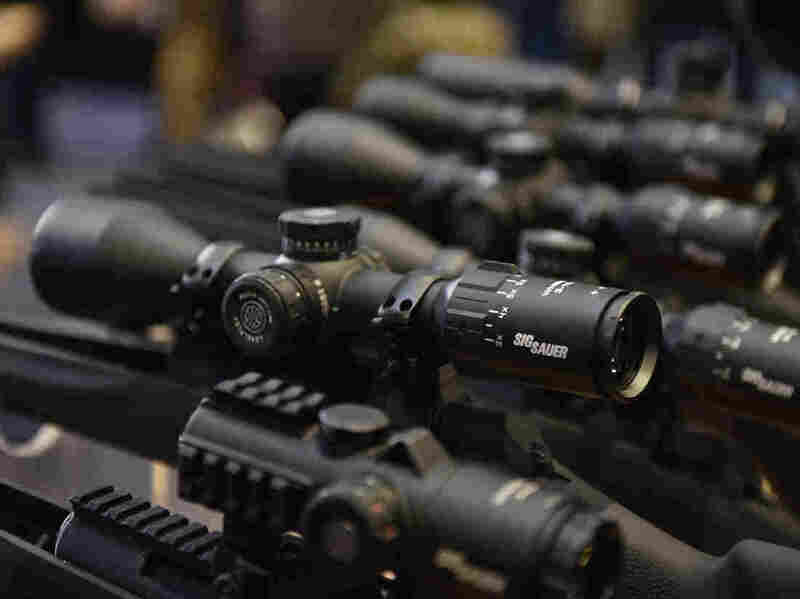 German prosecutors accuse Ron Cohen, CEO of gun manufacturing company Sig Sauer, of colluding with Sig Sauer's sister company in Germany to export pistols to Colombia in direct violation of Germany's export rules. A decade after Sig Sauer inked a deal to sell up to $306 million worth of pistols to Colombia's National Police, company CEO Ron Cohen is facing jail time in Germany for making the sale. German prosecutors accuse Cohen of colluding with Sig Sauer's sister company in Germany to violate that country's export rules. Under German law, companies are prohibited from exporting firearms or other weapons to countries in conflict. That includes Colombia, which is slowly emerging from a half-century of armed conflict. German officials allege Sig Sauer manufactured at least 38,000 pistols in the company's facility in the town of Eckernforde between 2009 and 2011, before shipping the weapons to its U.S. entity's headquarters in New Hampshire, which then completed the transaction with Colombia. Sig Sauer is alleged to have covered up the shipment's final destination by submitting false paperwork, known as end-use certificates, to German export officials, stating that the weapons were bound solely for the United States. The stakes for Cohen are serious: If convicted, he faces up to five years in prison and millions of dollars in fines. Last week, a German court found arms-maker Heckler & Koch guilty of similar export-related charges involving a sale of weapons to Mexico. While a former CEO was acquitted, two employees received suspended jail sentences, and the company was ordered to repay $4.2 million. Many details of the Sig Sauer case remain unclear, in part because German prosecutors will keep documents related to the charges against Cohen under seal until the trial begins on Feb. 26. The corporate relationship between the German and U.S.-based Sig Sauer companies is also not completely clear. L&O Holding, a conglomerate based in Germany, owns both the German and U.S.-based Sig Sauer companies, as well as a third firm, Swiss Arms. The companies appear to operate as independent entities, though it isn't clear how closely they may collaborate. But prosecutors allege that officials at the two companies worked hand in glove to hide the nature of the Colombia arms sale. Emails leaked to the German media show employees at the German and New Hampshire entities discussing the "USA/Kolumbien" transaction, and images of Sig Sauer weapons bearing a "Made in Germany" imprint have surfaced in Colombia. In addition to Cohen, two German executives have also been charged in the alleged plot: Michael Luke, who co-owns L&O Holding, and a man identified by the courts as "Robert L." The company, separately, is also facing substantial fines. The trial, which will take place in the city of Kiel, Germany, is scheduled to conclude in late June. Sig Sauer's New Hampshire operations didn't respond to multiple requests for comment, but the company did release a statement to a firearms blog in October saying that its actions were in "compliance with U.S. law." The company doesn't deny that it may have violated German law, however. The Sig Sauer transaction involving Colombia first made headlines in Germany in 2014, in part because of information released by multiple whistleblowers, including an employee based in New Hampshire. That person, who hasn't been publicly named but is expected to testify in the trial, contacted an anti-weapons group named Action Outcry — Stop Arms Trade, providing it with documents and emails showing that the final destination of the pistols was not the United States, as stated in the export documents, but Colombia, according to Action Outcry's attorney Holger Rothbauer. "Sig Sauer just retagged the big boxes and without opening them, just delivered them to Colombia," Rothbauer said. "I would call them dirty deals." Rothbauer believes that the company lacked production capacity in New Hampshire at the time to complete the contract for Colombia, and turned to its sister company for help. A Sig Sauer attorney contended that the deal had the blessing of the Obama administration. Cohen, who served in the Israeli army and took over as CEO in 2005, is credited with saving the gun-maker's American division from financial ruin. "We were down to about 75 employees, and it was on shaky ground," said Bud Fini, executive vice president of Sig Sauer, in a promotional video honoring Cohen's induction into the NRA's Ring of Freedom. "Ron had a vision." Today the company employs about 1,400 people at its New Hampshire plant. Perhaps its most significant achievement to date was winning a $580 million contract to provide the new standard-issue sidearm for all U.S. Army soldiers, the first such change since 1985. The slogan "Born in Europe, Perfected in America" is prominent on the company's website. But as Sig Sauer continues its rise in New Hampshire, the German sister entity faces challenges. After the investigation into its role in the Colombia deal made news, all Sig Sauer exports from Germany were temporarily halted. In 2015, the company laid off 73 employees, according to media reports, leaving fewer than 100 employees in Eckernforde. At its peak, the company reportedly employed more than 500 people.